Lodestar Family Eye Care defines a star as someone that leads or guides. We followed in their footsteps when designing their website accordingly. When you enter the website, you are immediately immersed in the modern display their site possesses. Combine the yellow and blue color palette alongside their white wall background, and you have the start to an amazing website. When designing any website here at Optimized360, we tailor to our client’s vision to market and reflect their goals properly. 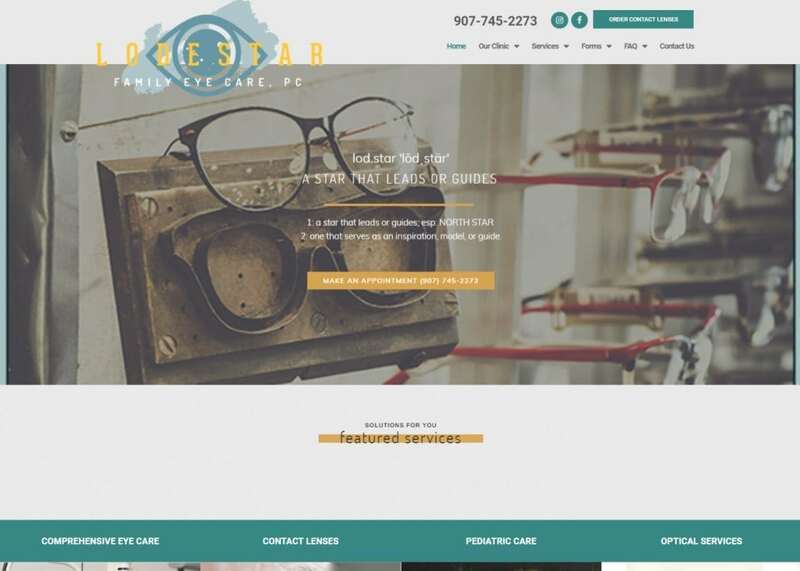 The overall design approach we took when tackling Lodestar Family Eye Care was one that we could all relate to: friendly, easy to read, and modern. From the concise navigation menu to the humbling website homepage, Lodestar focuses on their services and clinic goals by skipping all the flashing lights that usually come with modern websites. The incorporation of a soft color scheme within the child-friendly photos throughout the website tugs at the reader’s heartstrings. Need to book an appointment? Never miss the opportunity with Lodestar as their contact form is on full display on the navigation menu, bottom of the homepage, and even on the top of the homepage. The website also has social media widgets easily recognizable at the top of the page. In addition, they also offer a neat option to pay your bills online – perfect for anyone who hates making bill payments at the end of each month. We all know how boring and slow bills can be. An FAQ is conveniently available to skeptical patients as well. When designing any website, we make sure that the font and color scheme do not collide with each other. We made sure that the cursive font that the website displays does nothing but compliment the soft colors on display. Engaging the reader’s eyes is half the battle. The mission statement located strategically at the bottom of the homepage should seal the deal with clients in dire need of eye care. The design element is simple and effective. No need for all the fancy interactions when you have the abilities to back them up. Besides, a simple and informative website is great for both younger and older audiences looking for their next pair of prescriptions.